© KCNA via KNS—AFP/Getty Images North Korean leader Kim Jong Un (R) and Cuba's President Miguel Diaz-Canel (L) arrive to attend an art performance in Pyongyang, North Korea on Nov. 4, 2018. North Korea displayed what could be the first official portrait of Kim Jong Un on Sunday, signaling a new stage in the young leader’s cult of personality. 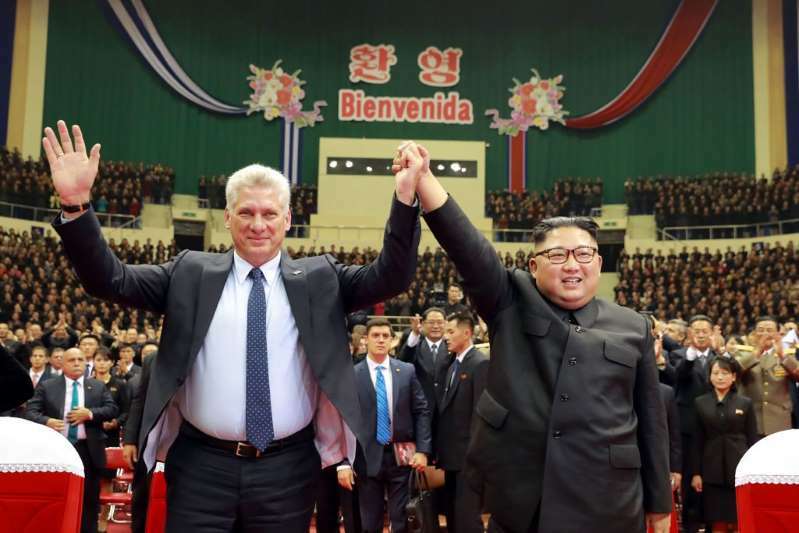 The new likeness debuted during a television broadcast of a visit by Cuban President Miguel Díaz-Canel, NK News reports. The painting features a grinning Kim in a Western style suit and tie, and was hung alongside a portrait of the new Cuban leader. Kim Jong Un is not known to have previously been the subject of an official portrait like those of his father and grandfather, Kim Jong Il and Kim Il Sung. The portraits are typically produced by Pyongyang’s Mansudae Arts Studio and are subject to strict regulations, according to NK News. Official portraits tend to be visible in almost every public space, and stand as important symbols of the country’s reigning dynasty. Kim Jong Un has more often been represented as a successor rather than a leading figure since he assumed power in 2011, according to the BBC. Yet the young leader has made significant breaks with his forbearers, fast-tracking the country’s nuclear weapons program and consolidating his own power by eliminating rivals. His international profile only grew this year following a historic summit with President Donald Trump in Singapore in June — an unprecedented achievement for a North Korean leader. The new portrait “is important as it symbolically makes him an equal to his father and grandfather” rather than “merely a loyal follower of what has gone before,” NK News analyst Peter Ward said. The unveiling of an official portrait would follow previous moves to codify the younger Kim’s place in North Korea’s leadership pantheon. Last year, the country announced that a new monument featuring Kim Jong Un alongside his father and grandfather would be built at its revered Mount Paektu.